Sometimes opportunities just sort of jump up into your lap and this past Saturday happened to be one of those times. I was attending the Columbus College of Art& Design’s annual Family Day and Homecoming weekend and it was during this event’s kickoff meeting that I found myself in the presence of a widely recognized journalist of the editorial cartooning variety. 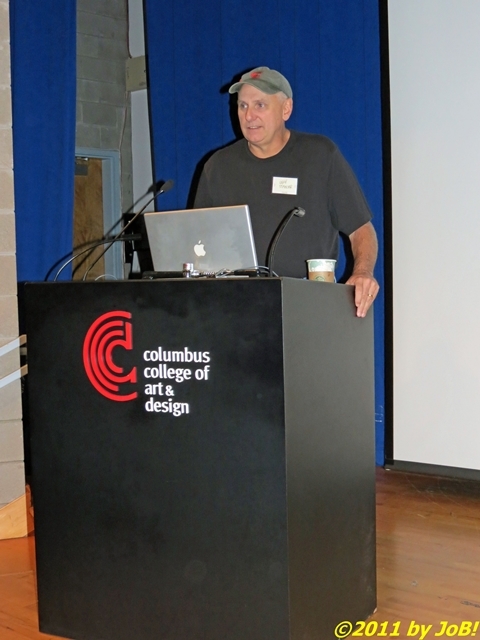 Jeff Stahler, a CCAD alumni, was serving as moderator of a panel of recent graduates describing their lives after leaving the school. An award winning cartoonist, Stahler draws regular panels for the ColumbusDispatch and a worldwide audience through Universal uClick (he also produces a daily freestyle panel called “Moderately Confused” for that same syndicator). Journalism or Bust! (JoB! ): You mentioned that you were a (CCAD) graduate in (19)78? JoB! : (19)77…(after graduation,) you did advertising for a couple of years. What gravitated you towards doing political commentary? JS: I don’t know that anything right here on campus actually helped drive me towards editorial cartooning. I enjoyed that style of art and the political and opinionated the journalistic end of it all came later. My dad was always involved with politics and so I had a little bit of that in my blood. The right opportunities came forward that led me into a cartooning career. JoB! : I read your bio as I was sitting in the audience and saw that you worked in Cincinnati first before you came here. JS: Actually, I worked here first. JS: Yes. I worked at the last two years at the Columbus Citizen Journal which folded in 1985. So I worked (19)84-(19)85 with the Columbus Citizen-Journal. Before that, I was an art director with Columbus Monthly magazine. I helped develop and design an editorial page for suburban newspapers. I said I’d do a cartoon on that page and I always wanted to do that. So that was one step and then it so happened that the neighborhood that one of those neighborhood papers showed up in was where the editor of the Citizen-Journal lived in. He had followed my cartoons for a couple years there. Somebody retired and he just called me out of the blue one day and said that this guy’s retiring would you like to come on and finish? So I did that and once the Citizen-Journal went down, I worked for the Cincinnati Post for 22 years. JoB! : And you came here in the late 90s? JS: I had been at the Dispatch…I think I’m in my eighth year here or seven years, something like that. JoB! : In terms of political cartoonists, is there a ‘club’? JS: There is an organization, the National Cartoonist Society, and there’s also an American editorial cartoonist society, too, so I’m a member of both. I stay more active with the National Society of Cartoonists since I do a comic strip, too. Mike Peters was a big influence. JoB! : He does the same thing where he has ‘Grimmy’ as well as his regular cartoon. Do you get any…I don’t want to say ‘hate mail’ …do you get any interesting criticisms? JS: No. I get a lot of hate mail. JoB! : I just saw some of your cartoons. Do you come mostly from a liberal or conservative perspective? JS: More of a moderate to liberal perspective. JoB! : I saw the Jobs panel you just did…a lot of people seemed to do their take on that. Is there a certain regular personality or politician you like to draw…somebody that kind of comes natural (to you)? JS: Well, every cartoonist has to get in their blood the current president of the United States. So with every president I’ve done, you embrace that as what you base your opinions on whether he’s good bad or indifferent. Those are characters you have to be able to draw blindly…anyone else I usually look at photos to study first. JoB! : Do you try to caricature or try to go and present a reasonable facsimile of the person? Did you try to accentuate like the former president, I think, was mostly he had the eyes and nose kind of thing and the current president with his ears? Do you try to accentuate those so that people will say “OK, that is President Obama” or “that was President Bush”? JS: Everyone I draw I look at as a caricature. We concluded our session at this point when I thanked him for his time as well as a recommendation he provided for a restaurant in the city's Short North District. This was a VERY cold interview but, in perspective, I believe I asked him about something that he has not shared in other venues (a short film by a CCAD student or in a 2010 interview with CNN's John King). JoB! : You mentioned that you were a (CCAD) graduate in (19)78? JoB! : (19)77…(after graduation,) you did advertising for a couple of years. What inside you gravitated you towards doing political commentary? JS: I don’t know that anything right here on campus actually helped me, drive me towards editorial cartooning so much as it did just the fact that art and I enjoyed that style of art not so much the political and opinionated the journalistic end of it all came kind of later. My dad was always involved with politics and so I had a little bit of that in my blood and just the right opportunities came forward that led me into a cartooning career. JoB! : I read your bio as I was sitting in the audience. I was able to pull it up on the Dispatch (website) and saw that you worked in Cincinnati first and you came here. JS: Yea. I worked at the last two years at the Columbus Citizen Journal was still here which was…it folded in 1985. So I worked (19)84-(19)85 with the Columbus Citizen-Journal. Before that, I was an art director with Columbus Monthly magazine. I helped develop and set up and design an editorial page for suburban newspapers. And so then I would put my cartoon in…I said I’d do a cartoon on that page and I always wanted to do that, And so that was one step and then it so happened that the neighborhood that those neighborhood papers showed up in the editor of the Citizen-Journal lived in that neighborhood and he had followed my cartoons for a couple years there. Somebody retired he said he just called me out of the blue one day and said that this guy’s retiring would you like to come on and finish? So I did that and once the Citizen-Journal went down, I worked for the Cincinnati Post for 22 years in Cincinnati. JoB! : And you came here in the late 90s, I assume? JS: Actually, I came here…I had been at the Dispatch I think I’m in my eighth year here or seven years something like that. JS: Mike Peters…there is an organization a national cartoonist society and there’s also an American Editorial Cartoonist Society, too, so I’m kind of a member of both I stay more active with the National Society of Cartoonists since I do a comic strip, too. But Mike Peters was a big influence. JoB! : Do you get any…I don’t want to say ‘hate mail’ …do you get any interesting criticisms? JoB! : I saw some of your cartoons do you come mostly from a liberal or conservative perspective? JoB! : Is there any particular politician or personality…I saw the Jobs panel you just did…a lot of people seemed to take that. Is there a certain regular personality or politician you like to draw…somebody that kind of comes natural (to you)? JS: Everyone I draw I look at as a caricature . If you compare the two transcripts, you will see that some 'clean up' and 'editorializing' did happen with the first while keeping true to the intent and spirit given in the second. Since I am new to this, I wanted to have both versions here and perhaps open a discussion on current/traditional interview transcription practices. Someday, when I get more than a smattering of visitors, that might actually happen.